No Comments, Angelina Jolie Photos, by sms4send. Before making house with movie star Brad Pitt, Oscar-winning actress Angelina Jolie didn’t have a problem generating headlines solo: She shared a shocking kiss with her brother, had bisexual interludes with a Calvin Klein model and wore a vial of ex-husband Billy Bob Thorton’s blood around her neck. 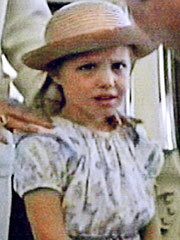 A 6-year-old Jolie appears with her father, actor Jon Voight, in Lookin’ to Get Out. It’s one of the few moments she spends with her father. Jolie would later say that their time together was always and only in front of a camera. Marcheline Bertrand allows her 14-year-old daughter’s older boyfriend to move in to their Los Angeles home, with Jolie and older brother James Haven. In her teens, Jolie suffers bouts of depression and begins cutting herself. “I had that problem early on when I couldn’t feel a bond with another human being,” she tells Allure in 2004. “Mostly it was all about trying to connect.” Jolie and her boyfriend break up in 1991.
back in Jolie’s own blood. Only her mother and his best friend attend the ceremony. 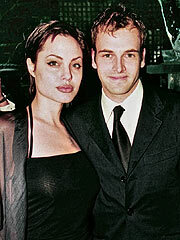 Though the marriage would prove to be short-lived – they split in 1997 and divorce in 1999 – the pair would remain good friends.